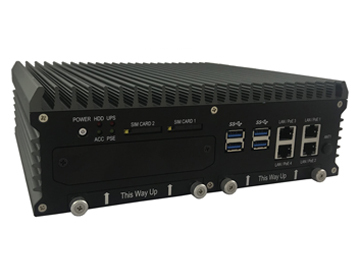 SINTRONES, the innovative provider of embedded computing solutions, is proud to introduce the new ABOX-5000, an intelligent, fanless box computer. The new ABOX-5000 was designed for multiple applications of industrial usage such us industrial control unit and intelligent / automatic factory. It is powered by Intel Gen6 Quad Core i7 CPU (Skylake) and Q170 Platform Controller Hub chipset with memory 2 x DDR4 2133 MHz SO-DIMM up to 32GB. The new ABOX-5000 was engineered using dual hot swappable SATA storage and optional internal battery kit for 10 minutes operating. It was designed for outdoor surveillance (NVR, DVR), outdoor / in vehicle digital signage and public transportation. In addition, the Fast Expansible Slot enhanced the expansible interfaces with mini PCIe slot, USB ports, SM Bus, GPIO Ports, PoE Ports and SATA slots (Customized for Customer without NRE Charge) . As for the power management, it has power protection with automatics recovery short circuit protection and vehicle power ignition for variety vehicle. And lest but not least, it has power off control that power off delay time setting by software and BIOS. With CE, FCC Class A certifications, the strong environmental tolerance is another strength that Sintrones continually focus on in operating temperature (-40ºC ~ 70ºC), storage temperature (-40ºC ~ 80ºC), relative humidity (0% RH – 95% RH). Combined all features above, the new ABOX-5000 is ideally suited for extreme environment that apply in national defense public sector, oil / gas / mining industry and energy industry like wind power and solar power. For more information, please visit : ABOX-5000 Product Page.